This EPSRC funded project (2010-2011) explored the feasibility of using ubiquitous technologies to engender change in people’s everyday habits. The aim was to explore ‘proactive’ and ‘provocative’ interactions by investigating whether and how a diversity of augmentation devices can encourage, enable or enforce people to change their behaviours in response to a particular desired human value, with a focus on environmental change. In particular, we investigated whether communities could reduce their energy consumption (Tidy Street Project), take more exercise (Twinkly Lights Project) and buy more food that was produced locally when nudged (Lambent Shopping Trolly). We designed and built an assortment of prototypes that were then evaluated in the wild, using novel affordable technologies, including wearables with micro-projectors, ambient displays and sensor-based devices. The research was intended to be ‘edgy’ and ‘informative’ – at the time – raising contentious ethical and political issues with the general public including issues of control, privacy and trust. The project partners were Open University (Yvonne Rogers, Paul Marshall, Jon Bird), Nottingham University (Tom Rodden), Sussex University (Dan Chalmers) and Goldsmiths (Bill Gaver). This project was concerned with a whole street reducing it’s electricity usage through the use of a simple web app and a novel street-sized graph visualisation that showed the outcome day by day. 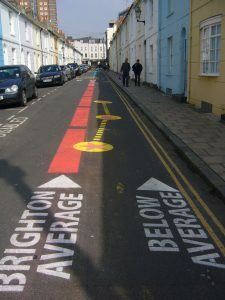 The participating residents were asked to read their electricity meters each day and then enter these into the website, which then worked out how much electricity they were using compared to the average for Brighton, and for other UK cities. The results were chalk sprayed each morning using a huge stencil by local artist Snub. 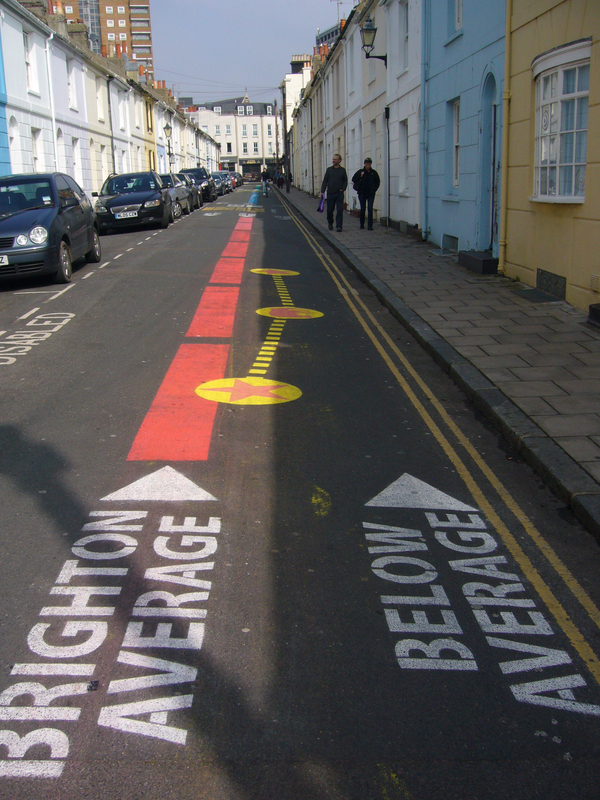 It showed over time how the Tidy Street energy use was being reduced in comparison with the Brighton average. It got lots of media coverage (e.g. the Guardian, the Independent) including a documentary made about it as part of Gary Hustwit’s ‘Urbanized’, and a workshop paper about the design of the project. The project was concerned with whether a distributed ambient display could nudge people’s behaviour to take the stairs rather than the elevator in an office building comprising two floors. The idea was to see if people’s awareness could be raised through glancing at a display about a particular behaviour that they normally overlook or try not to think about and in doing so reflect upon theirs and others’ behavior. The The theory that was used to inform the design of the displays was nudging theory (Thaler and Sunstein, 2009) which suggests that interventions can be designed to influence and change someone’s behavior at the point of decision-making. However, nudging theory does not suggest how to design technology in order to change people’s behaviour. So we hired a professional interaction designer (Susan Hertrich) – who had an eye for designing installations to fit into a place. She designed the twinkly lights and the clouds ambient displays. A research in the wild study was conducted over 8 months and it was foudn that there was a small but persistent change in behaviour during this time – there was an increase in people taking the stairs than the elevator. However, when asked, people did not seem to notice that they had changed their behaviour. (i) Twinkly Lights were an abstract representation that was meant to be playful and attractive, luring people to take the stairs. They were triggered whenever someone approached them. When someone stepped on the carpet a moving pattern of pulsating bright lights was generated. The intention was that the lights would lure them towards the stairs. (ii) The Clouds was designed as a fixed ambient display, where the number of people who have taken the stairs and the elevator is represented as two moving clouds of colored balls (an orange and a grey cloud) hanging from the ceiling. The relative height of the clouds were meant to change in relation to the number of people who take the stairs versus the elevator: the higher up the orange cloud the more people are using the stairs and the higher up the grey cloud the more people are using the elevator. Rogers, Y., Hazlewood, W., Marshall, P., Dalton, N. S., and Hertrich, S. (2010) Ambient Influence: Can Twinkly Lights Lure and Abstract Representations Trigger Behavioral Change? In Proceedings of Ubicomp 2010, ACM, 261-270. 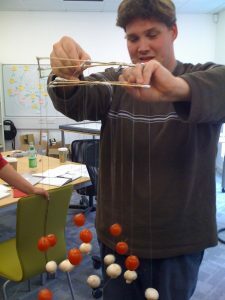 Hazlewood, W., Dalton, N. S., Marshall, P., Rogers, Y. and Hertrich, S. (2010) Bricolage and Consultation: A case study to inform the development of large-scale prototypes for HCI research. In Proceedings of Designing Interactive Systems (DIS ’10), ACM, 380-388. 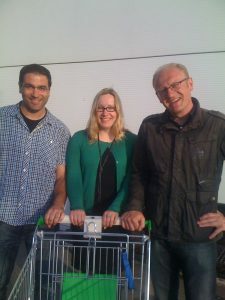 There are many apps designed to help decision-making when shopping but none of which can be easily used for a weekly shop at a local supermarket. We designed and built a minimalistic, mobile and fully functional lambent display that clips onto any shopping trolley, intended to nudge people when choosing what to buy. It provides salient information about the food-miles for various food items represented by varying lengths of LEDs on the handle and a changing emoticon showing their total miles against a social norm. When evaluated in situ, the lambent handle display nudged people to change their behaviour compared to ordinary shopping strategies; they chose products that travelled less, particularly for those that had greater choice of high mileage. They also felt guilty when the aggregate mileage of the contents of their entire shopping trolley was above the social norm. Vaiva Kalnikaitė, Yvonne Rogers, Jon Bird, Khaled Bachour, Nicolas Villar, Stephen Payne, Peter M.Todd , Johannes Schöning, Antonio Krüger and Stefan Kreitmayer. How to Nudge In Situ: Designing Lambent Devices to Deliver Information Salience in Supermarkets. ACM Ubicomp Conference, Beijing, September 2011. Todd, P., Rogers, Y. and Payne, S. (2011) Nudging the trolley in the supermarket: How to deliver the right information to shoppers. International Journal on Mobile HCI (IJMHCI), 3(2), 20-34. It also was featured on Channel 4’s Gadget Man with presenter Richard Ayoade. PRIMMA – An investigation into privacy issues surrounding location-based services, mobile devices, tracking and monitoring devices.